Building Healthy Communities (BHC) is a 10 year, $1 billion comprehensive community initiative launched by The California Endowment in 2010 to advance statewide policy, change the narrative, and transform 14 of California’s communities most devastated by health inequities into places where all people have an opportunity to thrive. Your zip code shouldn’t determine how long you live, but it does. In fact, health has more to do with place than doctors visits. The odds are stacked against low-income communities and communities of color. Building Healthy Communities is about changing rules at the local and state levels so that everyone is valued and has access to the resources and opportunities essential for health: affordable housing and fresh food, jobs that are safe and pay fair wages, clean air, and the other ingredients essential for a healthy life. The Endowment’s current work grew out of the priorities in the 14 BHC places, and the work at the state and local levels continues to reinforce one another. Transformative and sustained change takes power, youth leadership, strong partnerships, and a compelling new story about how health happens—or should happen—in all communities. To find out more about BHC, what we’re accomplishing, and how you might get involved, click on the links below. The “What” of BHC: Read about our outcomes and goals. The “How” of BHC: Discover our approach to investing in change. The “Who” of BHC: Meet the people on the ground engaging with their communities and The California Endowment. Why Place: Learn why neighborhoods have an immense impact on health. When people think of health, they often think of doctor’s offices and vitamins, not power and place. The truth is, health happens in community, school, and the places people spend their time. The current day differences in health outcomes between different neighborhoods did not evolve by chance or by the choice of the residents. Rather, the differences can be traced to intentional processes and policies designed to exclude some people based on race, sexual orientation, immigration status, age, disability status, and religion from the benefits of full membership in our society. The Framework for Health Equity (see below), developed by the Bay Area Regional Health Inequities Initiative (BARHII), helps explain how health happens and what we need to do to ensure health happens for everyone. The right side of the framework shows that our health is influenced by a combination of our access to health care, our genetics, and our personal choices. This is known as the medical model and research shows that health care and genetics are responsible for less than 30 percent of our health outcomes – our chances of developing diabetes, and so on. The other 70 percent or more lies with the social, political, and economic environments that shape the choices we make. 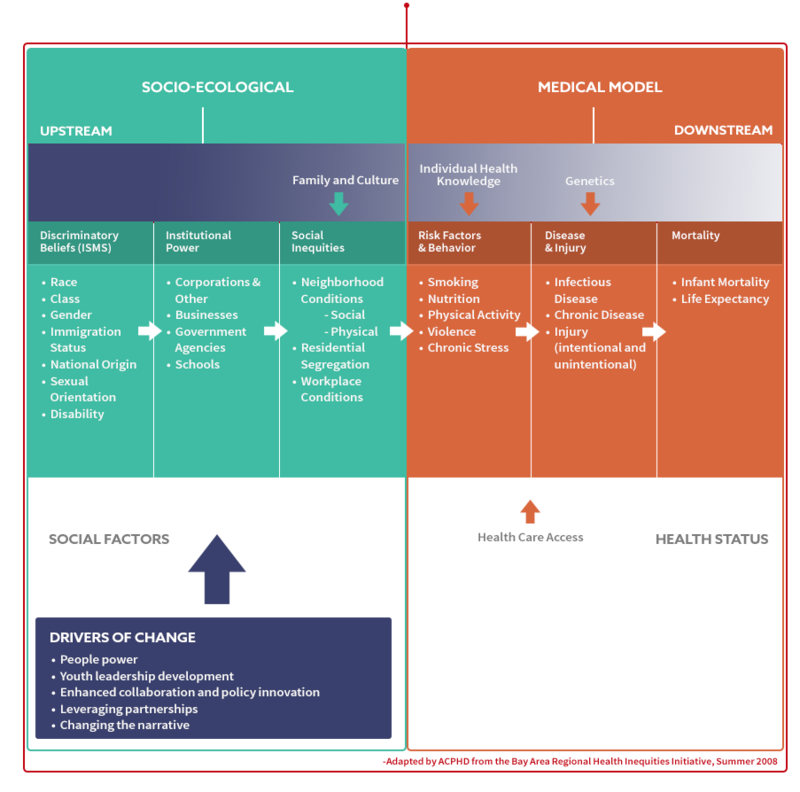 These are called the social determinants of health and their influence on health can be explained by the socio-ecological model, or the left side of the diagram below. Our values, beliefs and attitudes as a society influence our institutions, such as our schools or our financial system. These systems, and the rules and practices they enact and promote, in turn determine where business owners are permitted to open liquor stores, which parks are well-maintained, who gets a prime loan to buy a house, and so on. In other words, they determine the distribution of resources and opportunities and who has access to them. And to be healthy, one has to have opportunities to make healthy choices – to be able to afford healthy food and housing, good jobs that sustain a family, quality schools, breath air free of pollution, and so on. No amount of health care coverage will compensate for people who don’t have access to these essential opportunities for health. That is why Building Healthy Communities place-based investments prioritize working with residents, the public sector, and other stakeholders to transform 14 communities by changing the policies and systems that shape them. To learn more about the interplay between the Framework and how the work is being prioritized and implemented on the ground, check out our Drivers of Change. How revitalizing democracy will improve health outcomes for low-income communities of color; the relationship between racial justice, economic opportunity and educational achievement to public health; how his work takes health out of the doctor’s office and into communities. Dr. Anthony Iton believes that reinvigorating democracy in California’s underserved communities is the first step in improving residents’ health. As Senior Vice President of the Building Healthy Communities program, Iton is leading an effort to empower residents in 14 cities across California with the worst health outcomes to fight for changes in their communities that will help them lead healthier lives. When residents are engaged in holding elected officials accountable for fair educational opportunities, good jobs and more green space, Dr. Iton believes that good health can thrive. This place-based approach is founded on the idea that residents can’t be asked to eat healthier food, exercise more, regularly visit the doctor or get a better job if those opportunities aren’t available in the communities where they live. The BHC model attacks the root causes of health inequities by convening and supporting community partners on the ground. By building resiliency and advocacy among residents, his work has made significant and sustainable advances in public health for thousands of Californians. Prior to his appointment at The Endowment, Iton served as the director and County Health Officer for the Alameda County Public Health Department. Under his leadership, Alameda County launched an innovative plan to improve the health and lifespan of low-income communities by focusing on the poverty, racism and discrimination that prevented residents from getting good housing, better jobs and quality healthcare and educational opportunities. By inserting a public health perspective into conversations about community and economic development, he led the department’s efforts to improve community engagement and galvanize equity-driven policy solutions aimed at improving residents’ health. Iton’s dedication to improving the quality of people’s lives was founded during his contrasted experiences growing up in Montreal, Canada and attending medical school in East Baltimore, Maryland. The health inequities that he witnessed in Baltimore were almost unimaginable in Montreal, inspiring Iton to pursue a career at the intersection of public health and social justice. Published in numerous public health and medical publications, Iton is a regular public health lecturer and keynote speaker at conferences across the nation. He earned his B.S. in Neurophysiology, with honors, from McGill University, in Montreal, Quebec, his J.D. at the University of California, Berkeley’s Boalt Hall School of Law, and his medical degree from Johns Hopkins University School of Medicine. Beatriz Maria Solís, M.P.H., Ph.D. The importance of empowering women and youth in creating healthy communities; the public health effects of exclusionary immigration policies; the health effects of gentrification and displacement; the relationship between income inequality and health. Dr. Beatriz Maria Solís is leading efforts by the Building Healthy Communities initiative to ensure that California’s health policy is inclusive of residents regardless of race, gender and immigration status. Her work is guided by the principle that a system that excludes anyone, hurts everyone. As the director of Healthy Communities, South Region, Solís is working to transform health outcomes in underserved communities by emboldening residents to take control of policies that affect them. Recognizing that health disparities are created when communities are absent from the decision-making table, Solís has focused her career on energizing youth, immigrants and women. Her recent work with Building Healthy Communities has been focused on making healthcare accessible and inclusive. Solis spearheaded the Endowment’s 21st Century Pathways to Health Careers initiative, to expose underserved students to careers in healthcare. Solís also co-leads the Endowment’s #Health4All campaign to expand access to health coverage and care to all Californians—regardless of immigration status. Her work has helped undocumented children throughout the state gain access to the care they need. Solís has authored numerous articles, books, technical reports and policy briefs and is a lecturer/trainer to health care providers on topics including racial and ethnic health disparities, and culturally and linguistically responsive health care. Solís received her master’s and doctorate in Public Health from UCLA’s School of Public Health. How restorative justice in schools improve student health outcomes; how race and employment opportunities interact with health outcomes; innovative public health solutions that focus on community development and resident empowerment. Sandra Witt is an outspoken advocate about the importance that fair opportunities and access to basic needs such as jobs, housing, and affordable food have on public health across California’s communities. As the director of Healthy Communities, North Region, Witt has been working to help elected officials and community residents understand that health extends beyond the doctor’s office. In her 20 years as a public health expert, she has seen that health disparities exist in environments where it’s easier and cheaper to buy fast food than a fresh apple, or where parks, jobs and affordable housing aren’t available to residents. Witt’s goal of eliminating health inequity is powered by her philosophy that affected communities must be included in shaping the solution. Alongside partners on the ground, Witt has led efforts to change policies that ultimately lead to poor health outcomes. With the support of the Building Healthy Communities team, residents in Oakland have improved school discipline policies to help students stay in school and learn the skills they need to be successful adults. She has led efforts to help residents across Northern California sign up for health care. In communities from Salinas to Richmond, she has supported efforts to empower residents to hold their local leaders accountable for creating healthy opportunities in their communities. Prior to joining The Endowment, Witt served as the Deputy Director of Planning, Policy and Health Equity for the Alameda County Public Health Department. During her time there, she studied the relationship between poverty, inequality and poor health outcomes. Witt has worked in every aspect of public health, including as an epidemiologist and community researcher for the Alameda Public Health Department; public health consultant for the International Health Programs of the Western Consortium for Public Health in Santa Cruz, CA; and as a health and development program officer and consultant for the International Development Research Centre in Ottawa, Canada. She earned Dr.PH. in Maternal and Child Health from the School of Public Health at the University of California, Berkeley. She also holds a Masters in Public Health and a Masters in Latin American Studies/Anthropology. As the year 2015 came to a close, we touched the halfway point of our 10-year Building Healthy Communities (BHC) strategic plan. This plan focuses on improving the conditions under which young people in underserved communities can be healthy and thrive. As you know, a significant portion of the plan involves “place-based” attention on 14 communities across the state. Of equal importance is how the collective learning and energy from these communities contribute to statewide policy and systems change to promote health, health equity and health justice. BHC is a place-based strategy, but with an attitude for statewide change—we call it “place-based-plus” in shorthand.